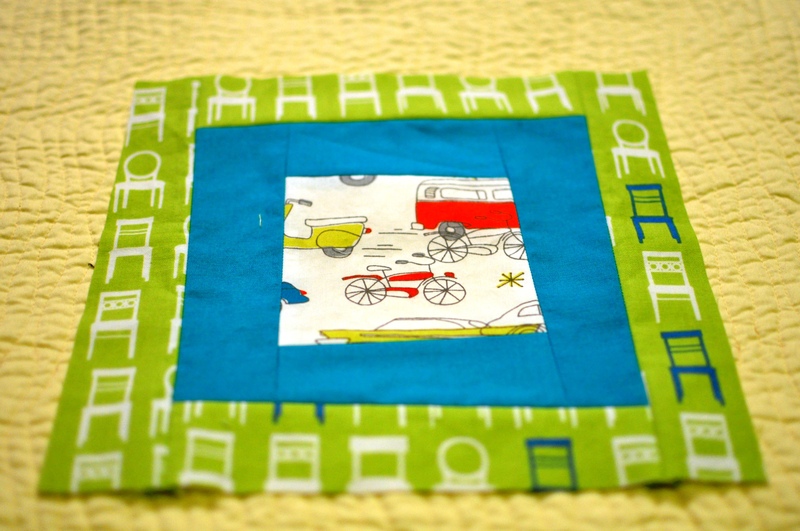 I’ve made it a tradition to make each of my nieces and nephews a quilt when they are born. This newest quilt is for my brother and sister-in-law’s adorable newest addition, Josephine Addison (she’ll go by Addie). It was so fun to make another little girl’s quilt, since the last two family quilts I’ve made have been for little boys (here’s the set, if you’re interested: Ethan’s Quilt, Sammy’s Quilt, Maddie’s Quilt). 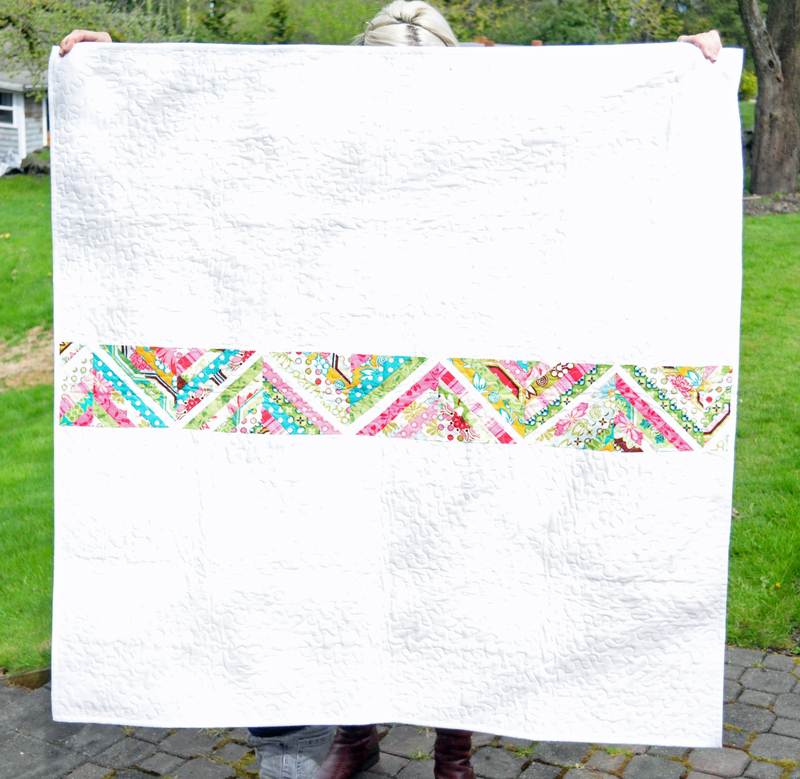 This turned out to be such a colorful string quilt, and I even got a little help from my friends in the Modern Quilting Bee! The back simply features a row of strings, sandwiched between the stark white. I quilted it with a random stipple design, although it’s hard to see it in the pictures. Each family quilt has a label, and for this one I decided to use my machine’s alphabet to embroider the tag. 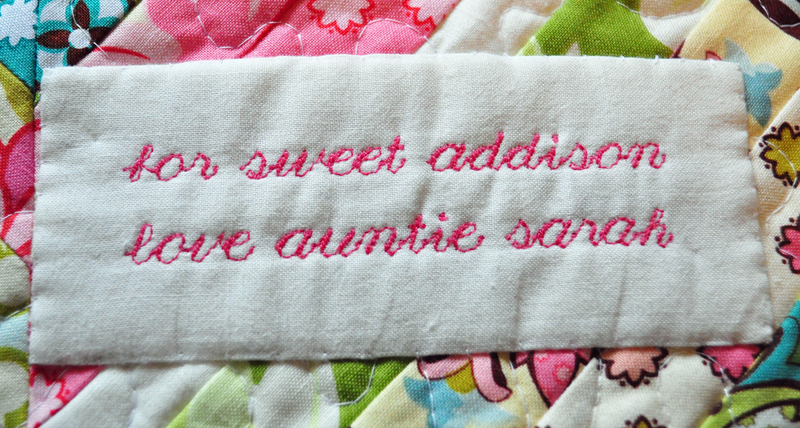 I so hope Addie will love her quilt and that it will stay in the family for generations to come! 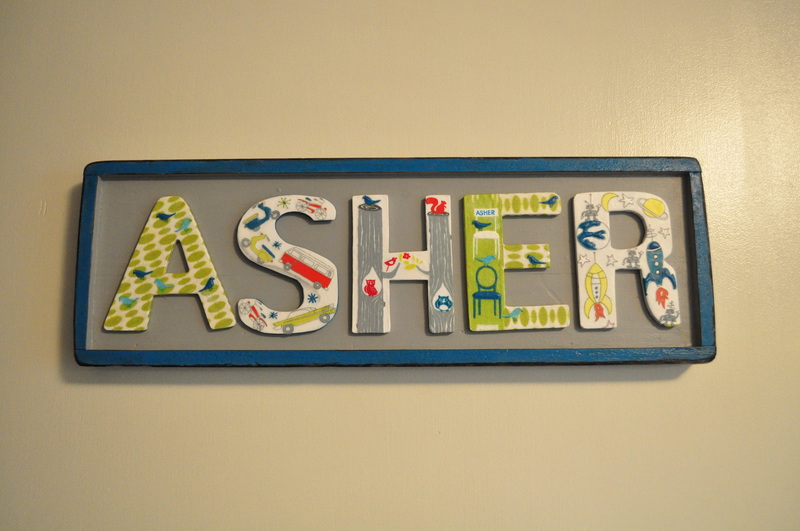 When I commissioned Levi’s mom to make a nameplate for Asher’s door, I had NO idea she would come up with something as special and beautiful as she did (although I should have known!). She asked if she could borrow some fabric samples from the quilt I am making for Asher, and she ended up photocopying the fabric and decopaging it to the wooden letters. 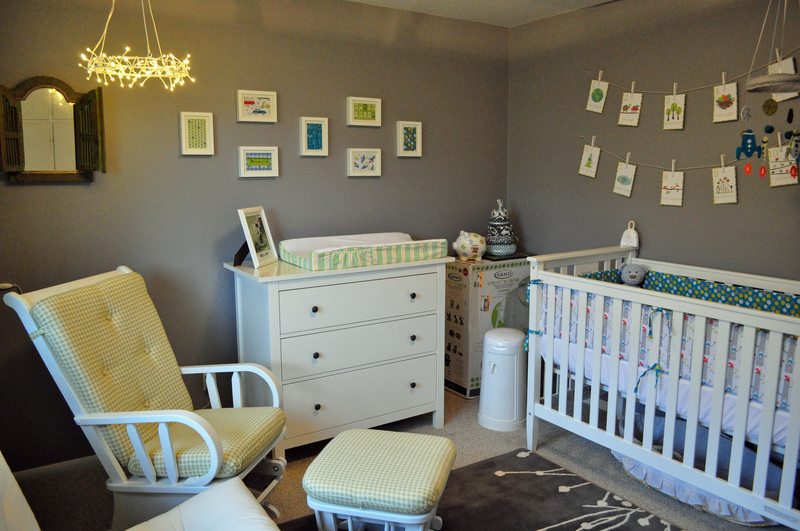 She even used the same grey paint as we used in Asher’s room. It turned out so wonderfully and I love that Asher now has something so creative and original made by grandma! Here’s my little sweetie, he’ll be 3 months in just over 2 hours! 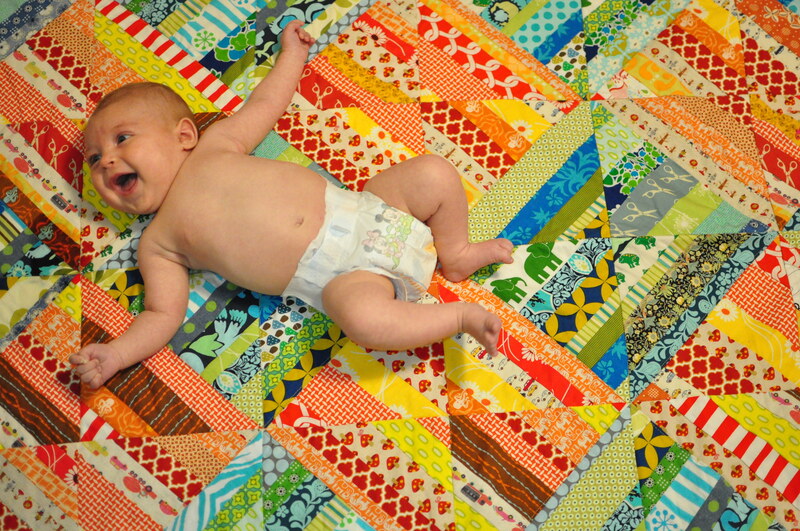 All smiles on his beautiful quilt from Auntie Emily! 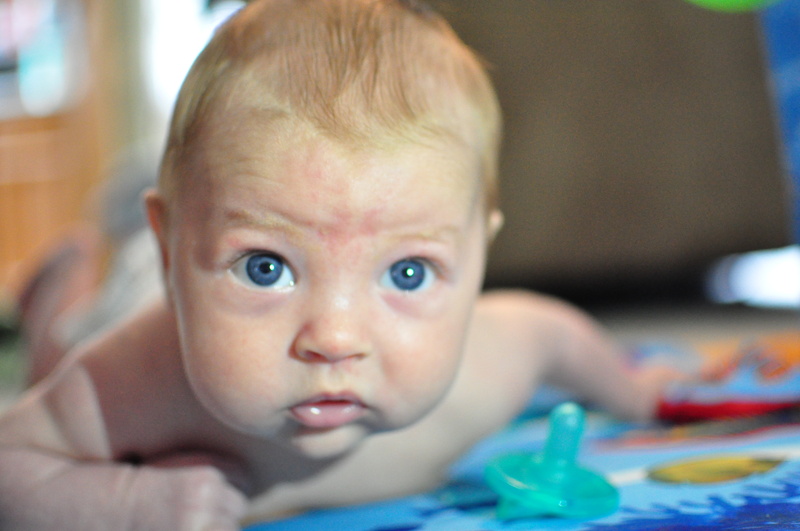 Hi Friends, I’m still trying to get the hang of this whole blogging with a baby thing, so I apologize for my radio silence! 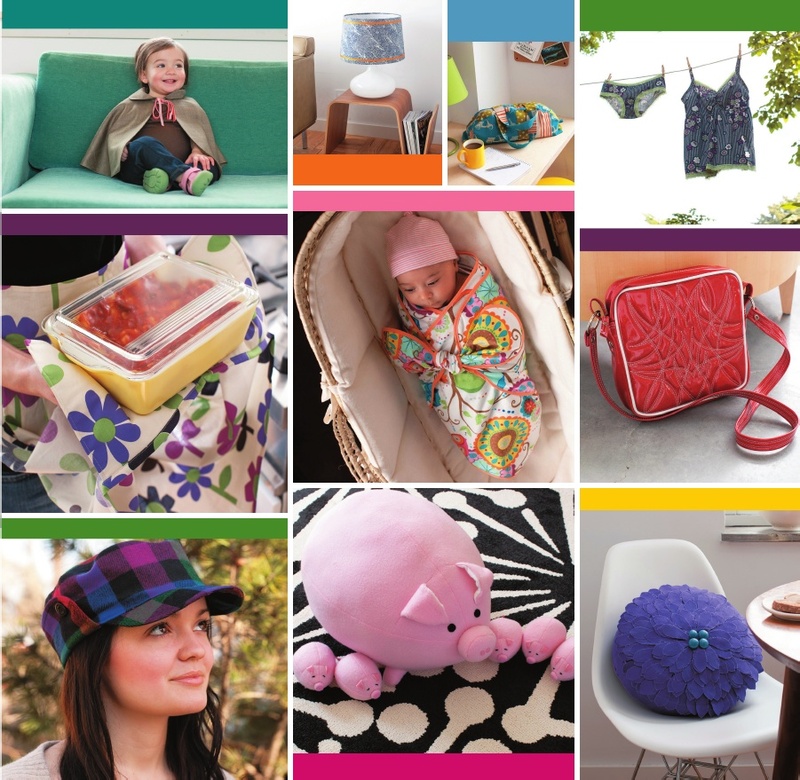 First off, I was excited to wake up Monday morning to see that my Undies Tutorial was featured on Grosgrain Fabulous! I’m a huge fan of this blog, so it was an honor to see that! Welcome to the new followers who found me through Kathleen, pop in and say hi in the comments! Head over to Facebook and “Like” One Yard Wonders to keep yourself up-to-date on the newest info about the book release! 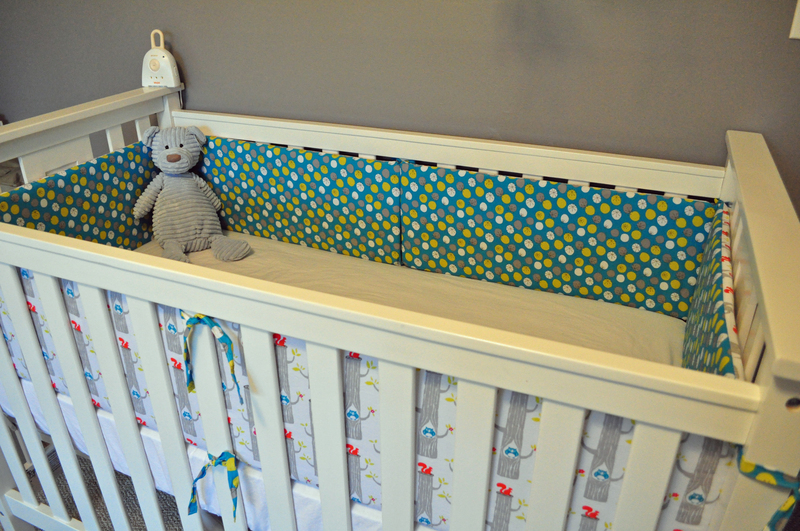 Welcome to my little boy’s nursery! The babe is due to show up one week from today, and his room is finally complete. I’ve been slowly decorating since January: planning, painting, purchasing and crafting. I couldn’t be happier with the end result; his room feels like an oasis and my husband and I love to just go sit in there and enjoy the space. This is the glider we found at Goodwill for $25. It originally featured an 80’s cherry red stain and the most horrendous flower print you can imagine. We primed and painted it this nice glossy white and I went to town recovering the cushions. I’ve never tried reupholstery before, but I was surprised at how easily it came together. 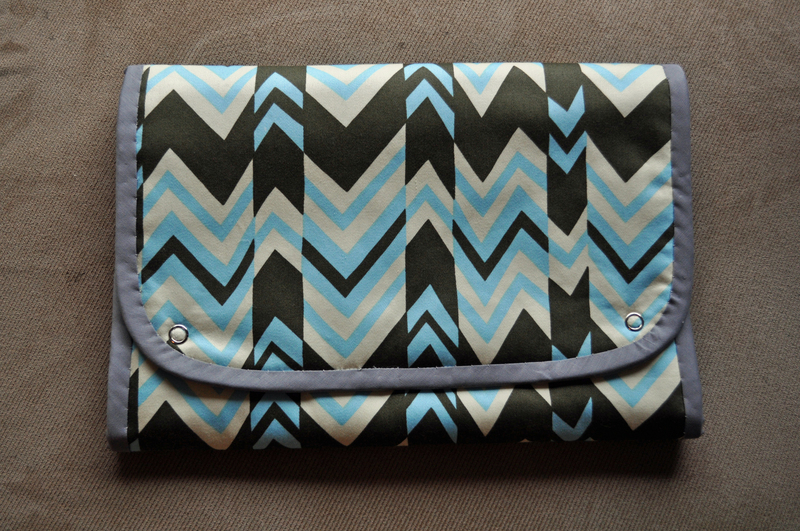 I simply ripped apart the seams of all the old pieces and used those to create the new pattern. The cushions themselves were in great shape so the only extra expense that went into this was $15 of fabric from JoAnns (used a 40% off coupon). Factoring in primer and paint, we spent less than $50 on this chair. Not bad considering these look-alikes at Pottery Barn will run you $928.00 for frame, ottoman and cushions (no, I’m not kidding, have a look for yourself!!). 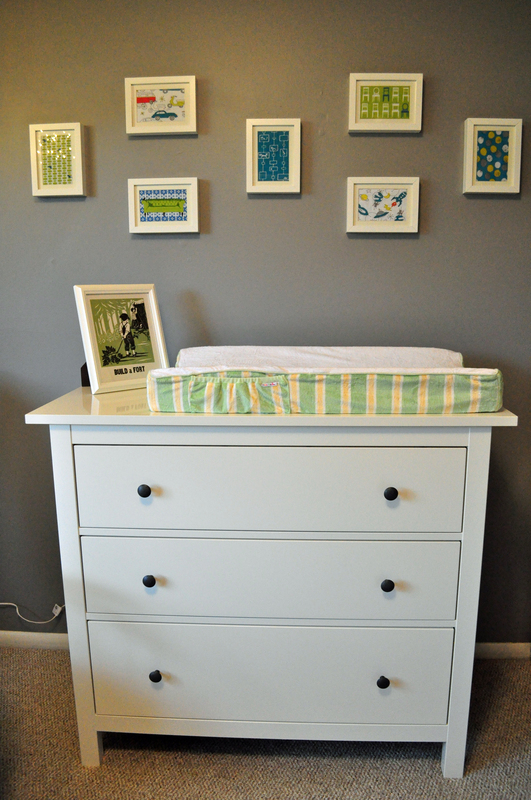 This is an IKEA Hemnes dresser, which we are using as the changing table. It was a craigslist find, so we got a great deal. This dresser is full to the brim of adorable clothes for our little one. The best part? To date we’ve purchased exactly 3 items of clothes for him. One was new (purchased the day we found out he was a boy) and the other two were consignment. 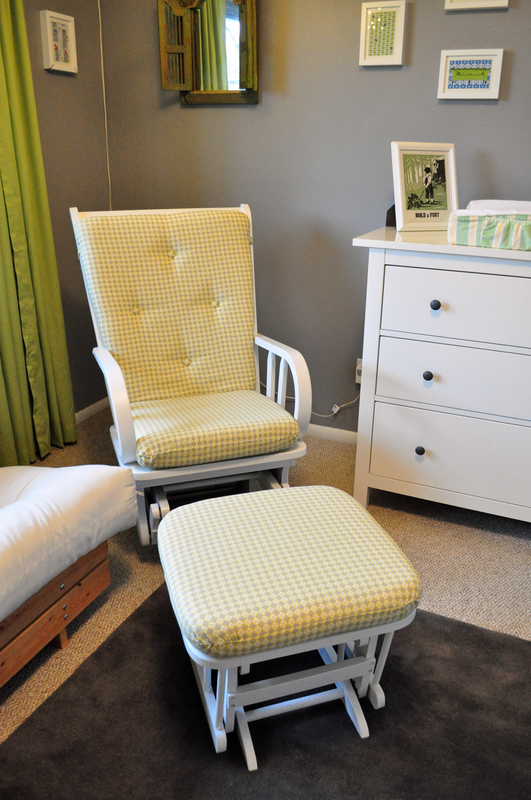 Talk about being blessed with a plethera of hand-me-downs and adorable baby shower gifts! We received so much clothes that I could only fit up through 6 months in the dresser! The rest is in back storage ready to come out as he grows. 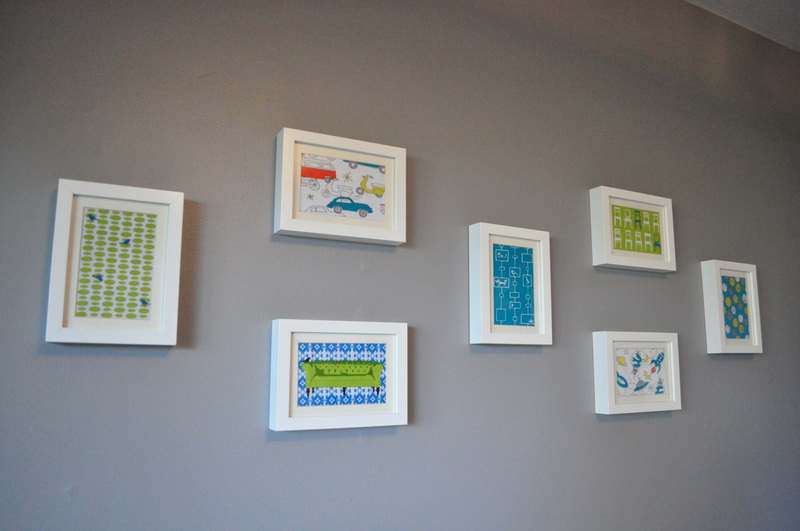 These are cheap IKEA frames which I used to highlight the fabrics I’m using in baby’s quilt. The fabrics are from Laurie Wisburn’s Tufted Tweets and Monaluna Circa 50s. 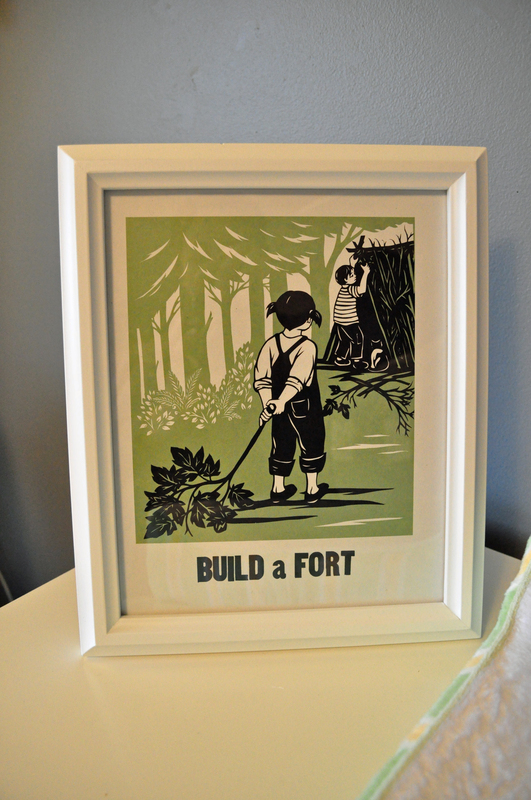 Framing fabric is such an inexpensive way to display art. Here’s his crib with the bumper I made. This is now the 3rd bumper I’ve made (two other were commissioned by friends) so I’m getting quite quick at making them. I think this one took about 2 evenings. The slowest part is all the hand-stitching at the end, but I enjoy it. 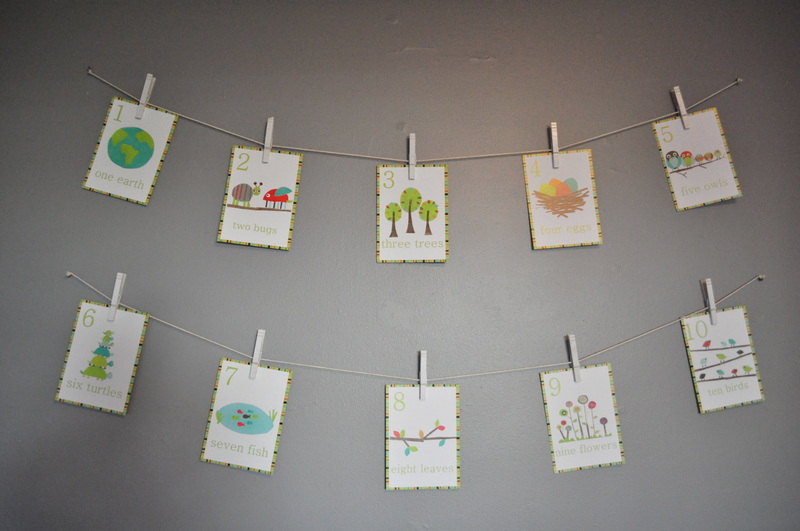 These counting cards are from Children.Inspire.Design. We just spray-painted some clothespins white and strung them above the crib. 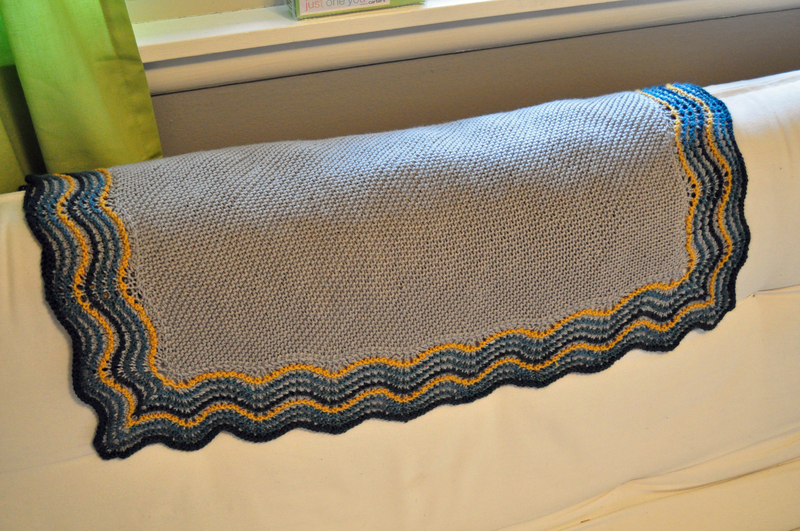 This absolutely gorgeous blanket was hand-knit by my dear co-worker. I am in love with the colors and the design and I know it will be something he will have his whole life! What a special gift! 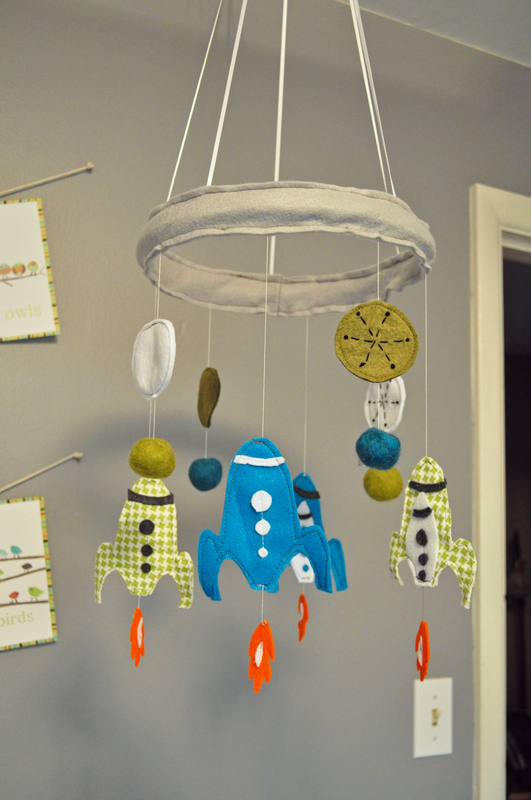 This is the mobile my dear friend made for baby. I had been looking for the perfect mobile for his room and I couldn’t find anything I liked. When I unwrapped this gift I was overwhelmed by how perfect it was! 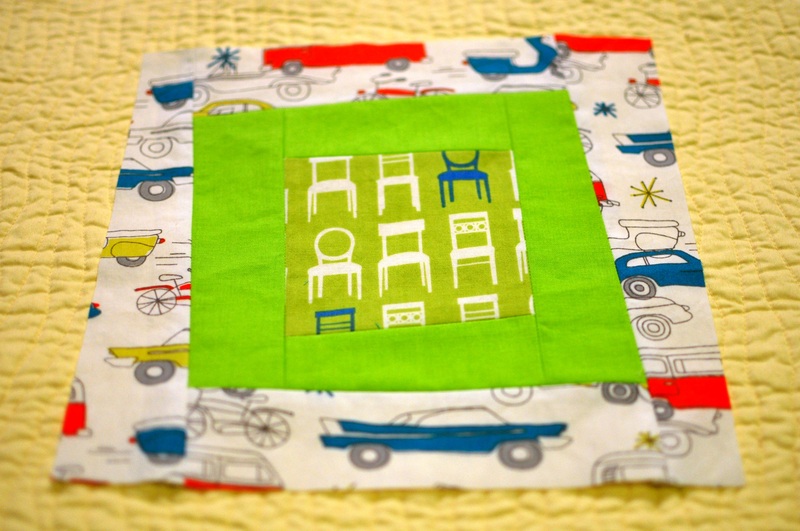 She copied the rockets from one of his quilt fabrics and, of course, used his room colors. I love it so much and I think it’s the most custom part of the whole room! Well, that’s the tour! I’m patiently waiting for him to arrive and I’ll be sure to pop on here once he has to announce his birth and also his name (yes, he has a name!). 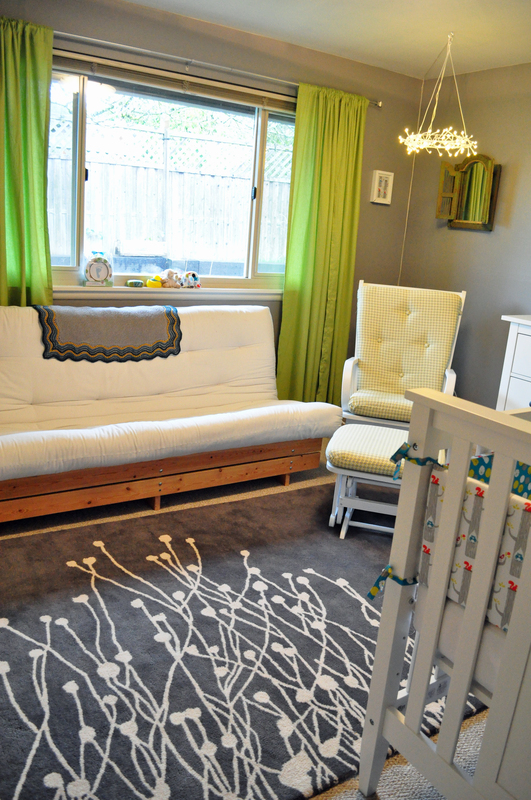 I’d love your comments on the nursery and any advice you may have for a new mommy! Finally, a finished project! 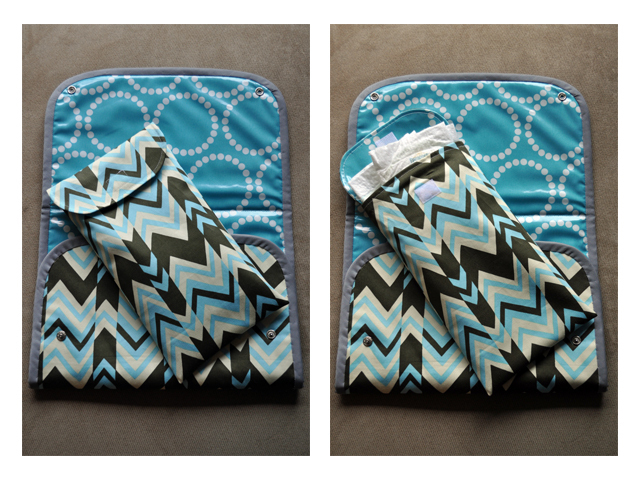 I made this changing pad and matching diaper/wipes case this week. 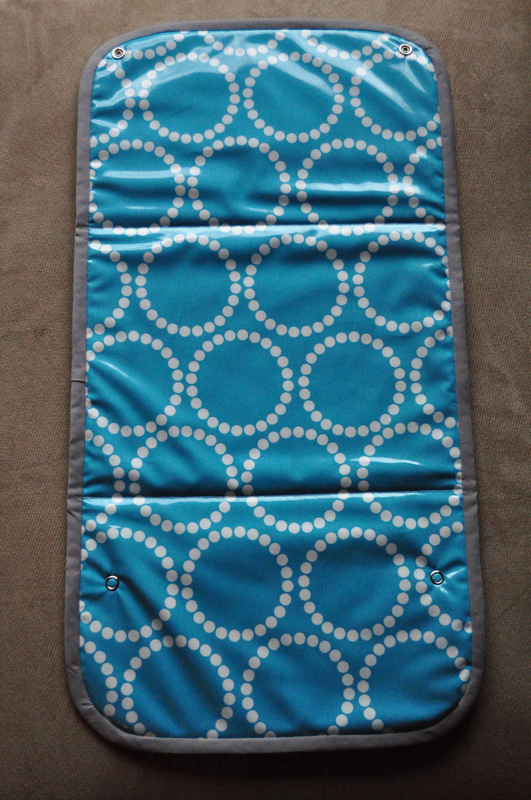 To make the changing pad, I cut the fabric to 12″ x 23″ and rounded the corners using a CD. I fused two layers of batting to the outer fabric and then sandwiched that with the laminated cotton fabric, then basted around the edges. 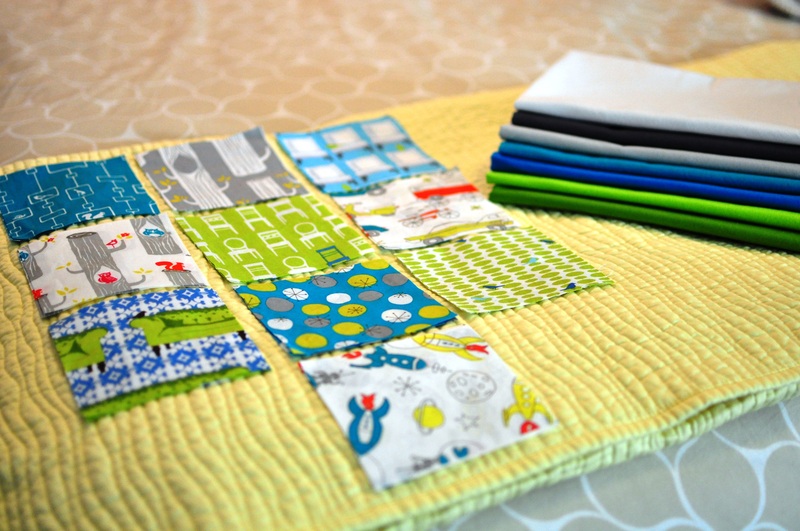 Measure 7.25″ from both the bottom and top and stitch a line to create the folding creases. Next, sew extra-wide double-fold bias trim (one 3 yard pack is plenty) to the laminated side, turn it to the back and handstitch it to the fabric side. Finally, attach snaps and you’re done! 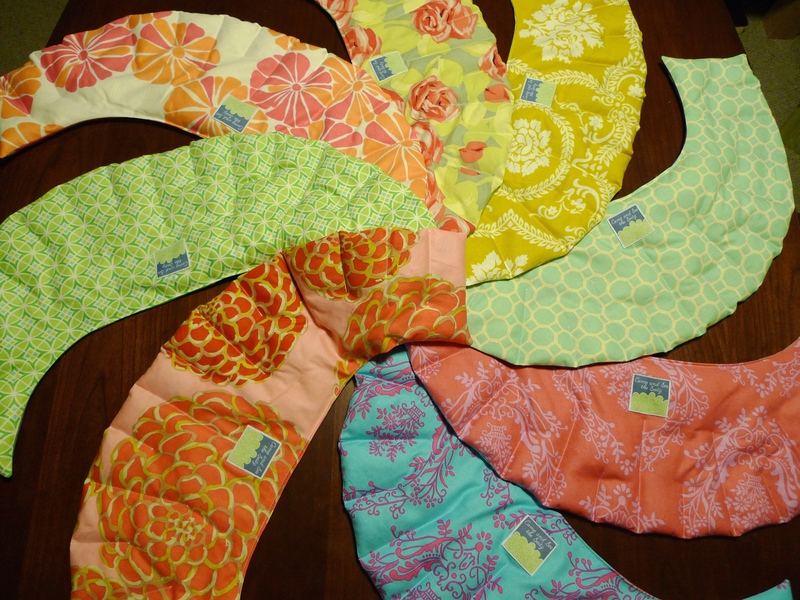 The diaper/wipes case is a pattern from One Yard Wonders. For fun, I also lined it with the laminated fabric. 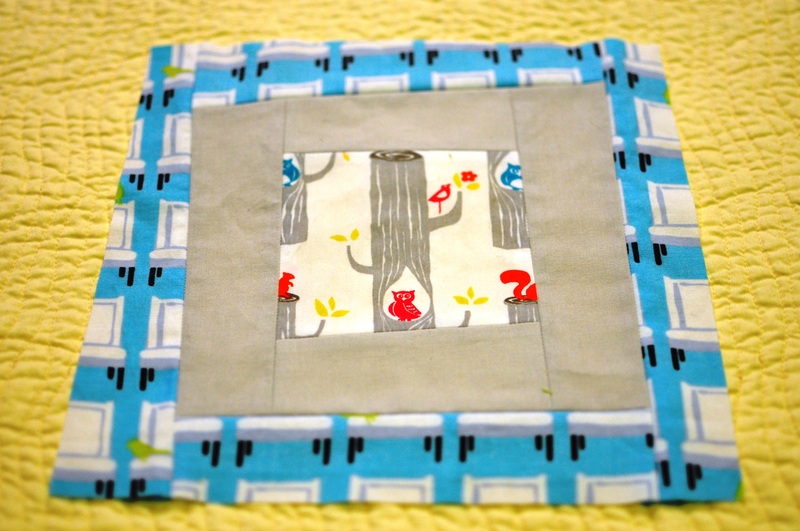 Next project on the docket is to make a Hooter Hider. I’m having such a hard time picking out what fabric to use! 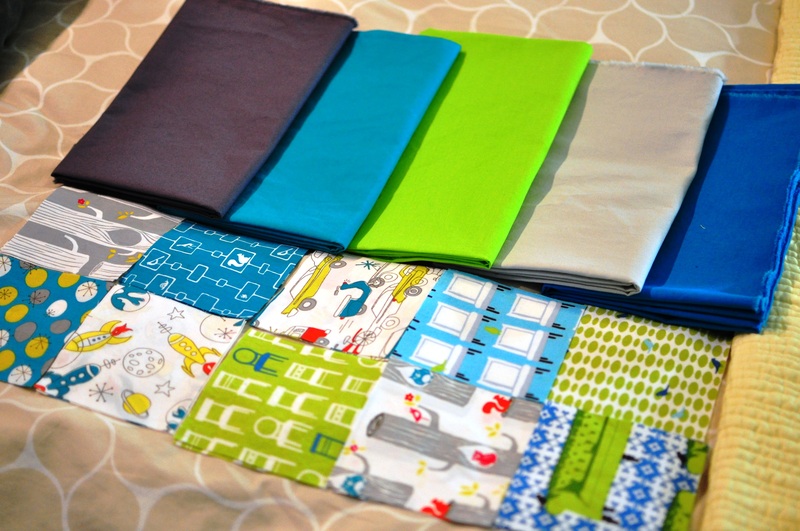 I’m not allowing myself to buy fabric since I have such a huge stash, but for some reason I just can’t choose! I’m kind of obsessed with this teal, apple green and grey color combo. 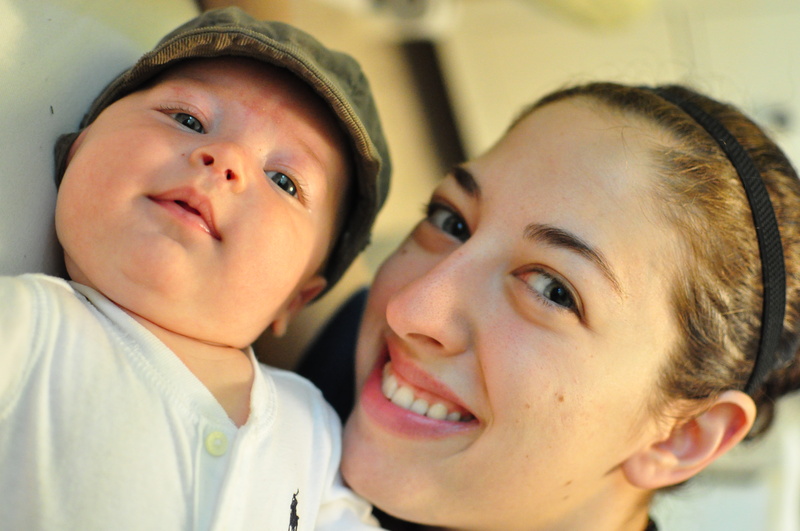 It’s just such a fun pairing for a baby boy! 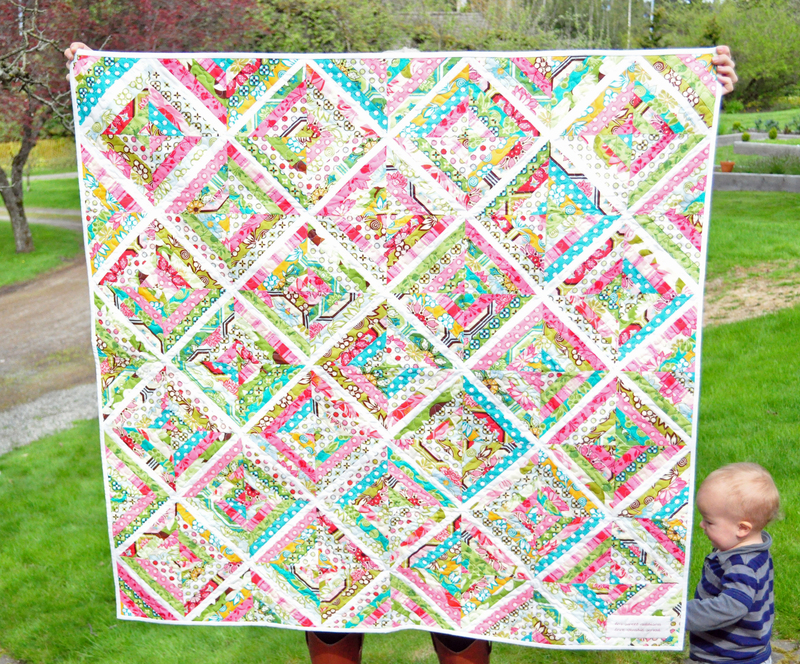 The fabrics are Laurie Wisburn’s Tufted Tweets, Monaluna Circa 50s and a collection of coordinating Kona Cotton solids. After setting out all the fabrics I decided to pair them up, choosing two prints that looked nicely together and a coordinating solid. The result was the following set of fabrics. 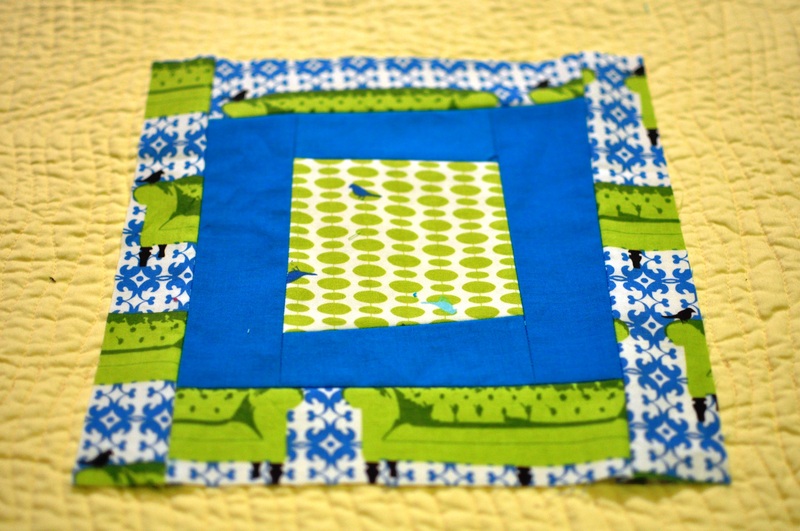 I’ve made 14 blocks so far and I figure I’ll need about 30 blocks to make a good sized quilt. Halfway there! 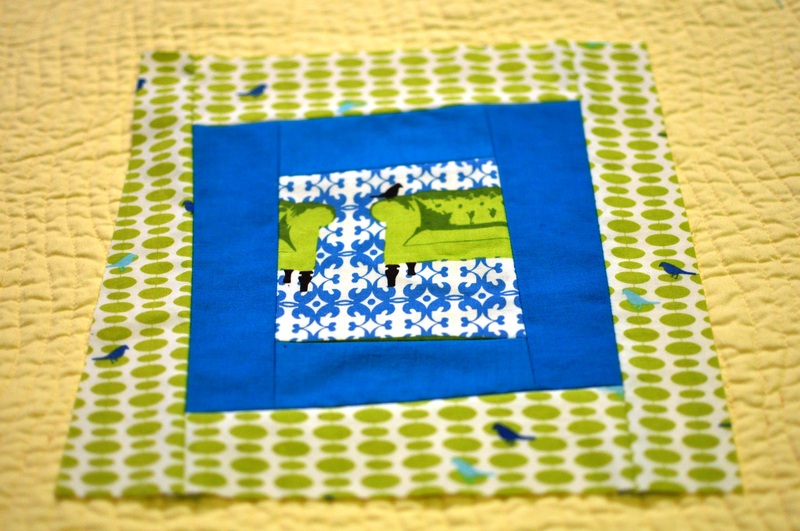 I am also debating whether or not I want to do sashing between the blocks. I’ll have to play around with it when I have all the blocks finished. 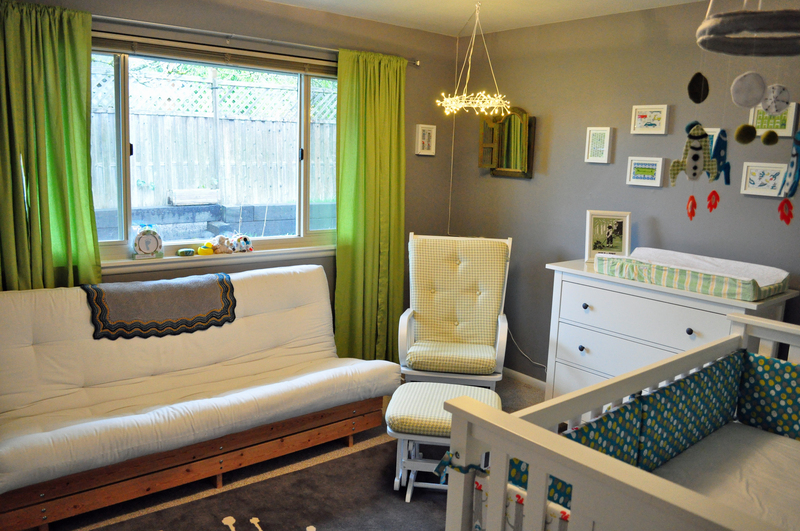 By the way, the nursery remodel is almost complete. I can’t wait to show you the finished pictures, it’s SUCH a great space! The glider turned out amazing, I’ll do a separate post for that. This year for my Christmas presents I put together pretty little packages for some of the special ladies in my life. 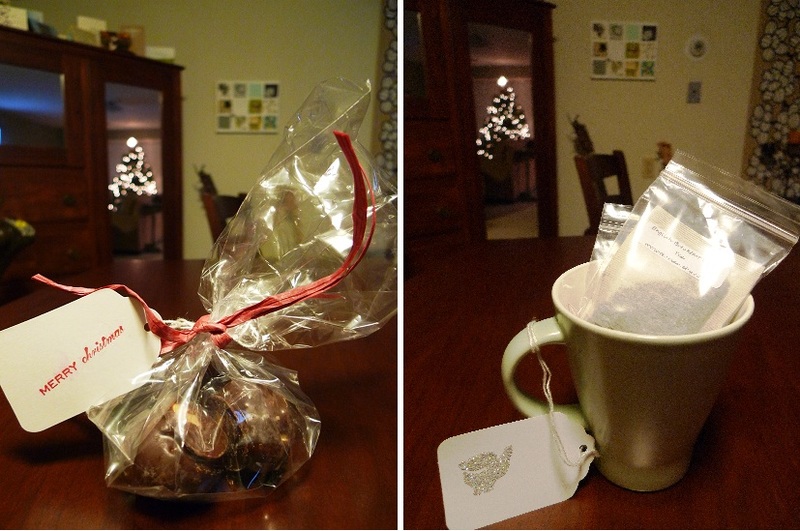 The packages contained a mug filled with delicious teas from The Teaman (Etsy), homemade Buckeye Cookies (I used a similar recipe to this one) and a Lavendar Neck Wrap that I designed and made. I had so much fun coming up with the packaging and labelling design, I think that was my favorite part! I ordered boxes online and decorated them with a beautiful stamp. I hope everyone had a wonderful Christmas and Happy New Year!